10 new pro model caps! You asked for it, you got it. 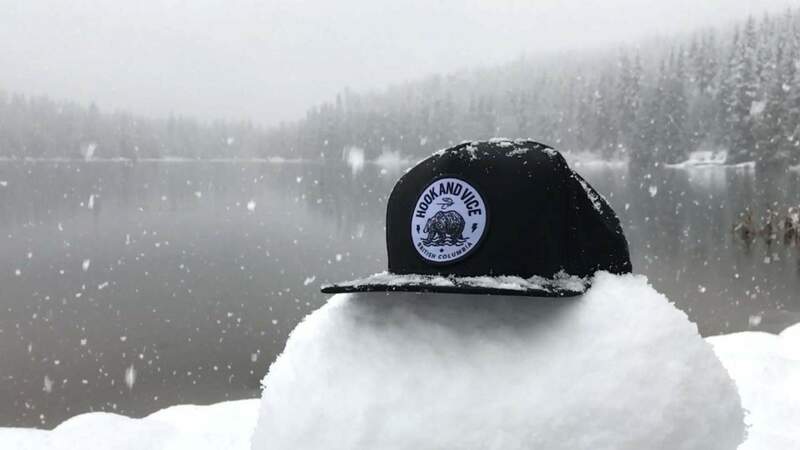 Hook And Vice makes lucky fly fishing hats, caps and gear designed in wilds of British Columbia and made for adventure in the great outdoors. Born in Beautiful British Columbia. Founded in beautiful British Columbia by adventures, thrill seekers and outdoorsmen who tie their own flies, love fly fishing and are always up for a good time. Perfect for on a night out and best worn in the wild with a fly rod in hand and good friends by your side. We tie our own flies because that’s how we get the flies we love. If you don’t tie your own flies reach out to a local tier because they know what’s needed. As a result you will catch more fish! Support your local tier. We ain’t your grandfathers fly fishing company. Most of all, you still gotta look good. Hook and Vice is equally at home deep in the wild without cellular reception, at a hip urban coffee shop and even a backwater dive bar. As a result, Hook And Vice is your wear-anywhere lucky hat. Our favourite meal is eating baked beans from the can and meat o a stick heated over an open fire. We draw our creative influences from our youth growing up off the grid in the wilderness on the West Coast of British Columbia Canada. A Hook And Vice cap is a damn lucky cap! If you want a unique and independent brand we feel that Hook And Vice make the best fishing hats and the best fishing t-shirts around. This is because our fishing hats for women, boys fishing hats, and men’s fishing hats are uniquely British Columbia and BC rocks. Our favourite cap at the moment is a fly fishing trucker hat. We love to fly fish, fly fishing, fly tying and creating unique fly tying patterns. We learned how to fly fish when we were young and our favourite type of trout fishing is dry fly fishing. We love all kinds of fishing because they all rock, but most of all our we love fly fishing. And if you want to catch fish you better have a lucky fly fishing hat. Hook And Vice make lucky bucket hats, fishing hats, fishing caps, kids fishing hats, women’s fishing hats, ball caps, toques, beanies and more. When the storm rolls in, you best have a dam good hoodie. Living wild and free is the way to be. Vice for Life is the life for me. Because you know what to do when the fish strikes. Fishing buddies, cold brews and good times. Hook And Vice make fly fishing hats, apparel, and accessories for the great outdoors. Born in beautiful British Columbia and worn around the world. To work less and fly fish more. We live the adventure, explore, and respect. If we pack it in we pack it out. We tie our own flies, use barbless hooks and keep secret fishing spots a secret! Our goal is to be a great storyteller and to live the dream. Vice for life. Designed in British Columbia and worn around the world. Hook And Vice is committed to quality, dedicated to fly fishing and is for those who want to look great both on the street and in the outdoors. Designed for those who demand style, prefer supporting an independent brand and are most at home in the mountains on a stream with a fly rod in hand. Hook And Vice makes lucky hats perfect for catching bigger fish and hotter dates. When you put on a Hook And Vice cap you instantly get 42% better looking. Wear Hook And Vice at the coffee shop before fishing, a day on the river, and out at the bar when your fly fishing day is done. You can find Hook And Vice fishing hats for sale at select retailers and online in our store. We also sell men’s clothing, women’s clothing, fishing caps, bucket hats, toques, beanies, t-shirts, hoodies, long sleeve t-shirts, kids clothes, phone cases, iPhone cases, mug, pillows and a whole lot more. Meet your lucky new hat. Once you put it on, you may never take it off, and you don't have to because it’s perfect for adventures, fly fishing, and good times. It's been known to make men stronger, women sexier, and all who wear it damn lucky. If you don’t believe lucky caps, just ask one of our Hook And Vice Ambassador team how their Hook And Vice hats have changed their luck! You can check out our Ambassadors on our team page and on social media. Use the hashtag #hookandvice when searching for us.